The 21st Annual LA Cancer Challenge is excited to name Dr. Mark Girgis and Dr. Jonathan King, both Assistant Professors of Surgery at UCLA, as the Honorary Medical Chairs of this year’s event. As past Seed Grant recipients and leaders in robotic-assisted surgery, these doctors are dedicated to helping find a cure for pancreatic cancer. The LA Cancer Challenge (LACC) is pleased to announce that Drs. King & Girgis have been named as the Honorary Medical Chairs for this year’s event. Chosen for their groundbreaking advancement of robotic-assisted, minimally invasive surgery, Dr. Mark Girgis and Dr. Jonathan King will participate in the LACC on Sunday, October 21 in Wilson Plaza at UCLA. Both surgeons are part of the Agi Hirshberg Center for Pancreatic Diseases at UCLA , the only integrated practice units of its kind where patients can get extensive evaluation and a personalized treatment plan in just one visit. 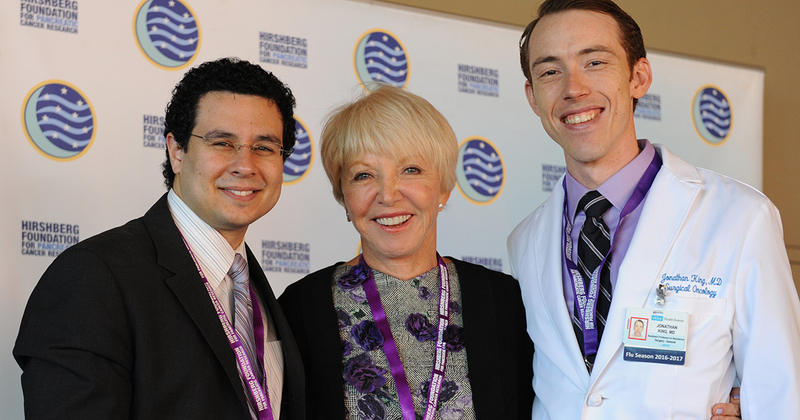 The LACC, held on the UCLA campus, is the Hirshberg Foundation for Pancreatic Cancer Research’s signature fundraising event. Now in its 21st year, the funds raised through the LACC directly benefit groundbreaking research via the Seed Grant Program. This year the Hirshberg Foundation received 51 Seed Grant proposals from across the country. These projects range in focus from treatment to targeted therapies, immunotherapy to metabolic regulation to the medical benefits of cannabidiol. The fundraising done by the LA Cancer Challenge community is key to funding as many of these projects as possible. Pancreatic cancer is one of the most lethal cancers, on track to be the 2nd leading cause of cancer-related death in the US by the year 2020. One of the difficulties in diagnosing the disease is the vague symptoms it presents, meaning that many cases are diagnosed once they have metastasized and surgery is no longer an option. The work that Drs. Girgis & King are doing with robotic-assisted minimally invasive surgery are helping to improve pancreatic cancer outcomes. “With so much optimism on the horizon, I count myself lucky to be a part of the Hirshberg Foundation, leaders in the field of pancreatic cancer,” said Dr. Mark Girgis, co-captain of the UCLA Surgical Bruins team.